The big question is: What do we do if and when our old mechanisms for coping with inequality break down?..A society with cheap robot labor would be an incredibly prosperous one, but we will need to find some way for the vast majority of human beings to share in that prosperity, or we risk the kinds of dystopian outcomes that now exist only in science fiction. And then there are more extreme measures...What if, when each citizen turns 18, the government bought him or her a diversified portfolio of equity?...This portfolio of capital ownership would act as an insurance policy for each human worker; if technological improvements reduced the value of that person's labor, he or she would reap compensating benefits through increased dividends and capital gains. This would essentially be like the kind of socialist land reforms proposed in highly unequal Latin American countries, only redistributing stock instead of land. "This would essentially be like the kind of socialist land reforms proposed in highly unequal Latin American companies, only redistributing stock instead of land." Also, I favor a more radical solution: The end of the family. Stop natural reproduction, make babies only in labs. Confiscate all property of the dead. Redistribute it to kids reaching majority age. If the kids reach majority age, they are not kids anymore. A more radical solution is a death star. The Administration does not support blowing up planets, but support blowing up or down small and medium country’s. Why would we not spend countless taxpayer dollars on a Debt Star if the only fundamental flaw can be exploited by a one-man starship and chineese don’t have starships….. I support destroying the traditional family structure as much as the next godless liberal, but I don't think it's terribly relevant to the discussion at hand. You can do the redistributive aspects of what you just said without having to do that other stuff. A certain amount of inequality is introduced by having children being raised by parents of wildly different abilities, but it's not like there's an immediately obvious alternative available. The problem is not parents with different abilities, is parents with different capital wealth. Especially if the capital is increasingly what makes money, this creates a caste society, where the owners of capital have more capital in each generation, and the owners of labor have each day worsening living conditions. Family is what keeps capital inequality in the society. If capital is where people got their money, you need to deal with the family. Unfortunately I don't think you can just redistribute money this way without destroying the family. Family ties are too strong. It's kind of easy to circumvent government estate taxes if you have the incentive. People are terribly against not been able to give their wealth to their children. "What if, when each citizen turns 18, the government bought him or her a diversified portfolio of equity?" - Intriguing, but is this any different from social security privatization? Yes. SS depends on how much you earn. People who earn less would have smaller accounts even under privatization. My suggestion is pure redistribution. I posted over there, too. Put me in the camp that thinks this will do what prior industrial revolutions did, which is to redefine old jobs and create new specialties (assuming that licensing and protectionism doesn't stifle it and lead to a smaller number of professionals enriching themselves). "Humans plus machines" is a pretty big possible alternative. But even in a situation where robots are both capable of producing what humans can, and have an absolute advantage in economic terms, you might still get humans employed due to comparative advantage. The board game Monopoly is a good, though slightly simplified, simulation of what you propose. How does that work out? It doesn't matter how unequally the game of Monopoly ends up; what matters is that in Monopoly there is equality of opportunity! I posted over at the Atlantic too - but I'm worried about it getting lost in the deluge. Have you considered Employee Stock Ownership Programs as a solution to the problem of growing inequality? Basically, the problem is that technological advances have reduced the value of individual human capital while creating greater returns to the owners of capital. ESOPs allow individual workers to participate in the amplified returns on capital created by technology. Additionally, in the US S-Corporations that are organized as ESOPs only pay federal taxes on the percentage of their profit that is not owned by their employees. So, 100% employee owned S corporations pay no federal income taxes on profits. Publix Supermarkets, the makers of Gore-Tex, and Springfield Remanufacturing are all examples of successful employee owned companies. I like this idea...the difference between this and what I proposed mainly has to do with corporate control! I'd be strongly in favor of pushing towards more ESOPs. I wonder if you could gradually force companies into it, as a price of going public (and put more onerous transparency regulations on large private companies, to push them into going public). ESOPs don't necessarily require surrendering of corporate control. A company that is organized as a 49% ESOP still has 100% of the control given to the owner(s). I generally like where Brett is going with his argument. The tax benefits are already a very good incentive for corporate owners. I think that ESOPs require some mixture of good advertising, social pressure, and incentivizing regulation to make ESOPs just as common as company health care plans and 401(k)s.
To give each citizen a portfolio of equities - a very similar idea was introduced in the novel Manna by Marshall Brain, discussing exactly the issues of robots and how automation had displaced human labour. Huh. I think I read the idea in a sci-fi novel or story somewhere, but I couldn't remember where. Here is, perhaps, a simpler (if more socialist) solution: simply mandate that the government shall be the sole owner of capital. The government will rent out capital at cost, and will build as much capital as there is demand to rent. This means that families can't accumulate capital, and the government can redistribute the rents as it sees fit. There would be no need at all for income taxes, unless additional redistribution is desired. Problem solved. In theory, at least. Look at China's state-owned banking system to see some of the potential problems with that. It's a recipe for politically favored firms getting a ton of money to float themselves, whether or not they're efficient and productive (and for connected people to enrich themselves). Plus, I suspect that the "long term rents" would gradually harden into outright property grants. Look at what has happened with trademarks and copyright - the expiration dates keep getting pushed back, even though it's supposed to just be a temporary protection designed to promote the creation of new technologies and arts. I'm a little bemused (and slightly frustrated) by the profession's near-unanimous decision to ignore the correlation between the shift of return from labor to capital---what used to be called the decoupling of productivity gains and median income, or the rise of the 1%---and the decline of the American labor movement. Both trends started happening in about '73-'75, and the logical relation is readily apparent. Further, if that relationship holds up, the obvious policy implication---restore the labor movement and watch equality rise automatically!---is a lot, lot easier than experimenting with untested small-business schemes. So you think the common person will be able to command their own private army of laborer robots successfully in a capitalist system ? That would be very cool. But I have big doubts. I think it would be simpler just to try and give the common people a far greater stake in the wealth being generated by these firms, like the ESOPs mentioned above (and potentially more radical practices). This idea strikes me as flawed in its human understanding. I hate to seem patronizing but it leads me to view you as (at least) sheltered in terms of economic status. I suspect you were raised in homogenous upper middle income neighborhoods and schools. If you had more of the hard knock life in you, you would know this couldn't work. Socialization does not end at l8. Adults continue to be socialized - in the work place. People who are out of work for a long time, whether they be on welfare, on disability, or trust fund babies (I've known all types) become progressively less fit for the workplace. They usually lack certain kinds of maturity, those involved in getting along with diverse people, deferring gratification, making choices and serious commitments, and the like. Being in the workforce is really really important for lower class men, especially. It is major part of getting a life back after prison or addiction. Marriage and a stable job tend to go together. I think the notion of a society that is 'post-work' is a fantasy drawn up by the intellectual and economic elite who imagine it as a kind of intellectually stimulating vacation. You need to pay more attention to the real role of work in grounding family and community. Perhaps, but the workplace isn't the only possible scenario where people can build such skills. In an idealistic world of prosperous leisure, people would presumably engage in structured hobbies, and if people aren't engaging in "enough" hobbies you could have the government "encourage" people to do more of that sort of thing. Of course exactly what sort of "encouragement" would be involved would raise rather messy tradeoffs of liberty versus well-being. I believe that the post is addressing the concern that the world becomes one huge semi-feudal society like much of Latin America. If machinery becomes the most important factor of production, and that machinery is controlled by a very small group of people, unless we use means on the politics/violence continuum, we could well end up in a very rigidly hierarchical, anti-democratic world. Work would very well ground family and community in that world. I still prefer the bill of rights and the franchise. You should definitely support increased access to birth control and the increased acceptance of childlessness, then. Division of the remaining human labor and fiscally imposed income equality is really all you need to win over SkyNet. Redistribution is fundamentally a political problem (and I'm not sure what is gained by making one-time grants of stock rather than, say, guaranteed income). Given the current response to recession is to cut the safety net (and this response is cheered by much of the economics profession) I'm not optimistic. Add in increasingly scarce resources and a worsening environment, and it doesn't get better. Sadly, I think we're getting closet to debtor prisons, than we are to equitable redistribution. "And then there are more extreme measures...What if, when each citizen turns 18, the government bought him or her a diversified portfolio of equity?...This portfolio of capital ownership would act as an insurance policy for each human worker; if technological improvements reduced the value of that person's labor, he or she would reap compensating benefits through increased dividends and capital gains"
God help the guy born in the equivalent of 1999. Is this really the right approach? (And where do all these stock come from)? Isn't a citizen's basic income better (averages out fluctuations, provides a reliable income as a base for borrowing) etc. And it could start at birth. Giving a lump sum to 18 year olds (of all people) is a recipe for frequent disaster. I think this is an interesting subject, but I doubt it's a realistic problem for a long period of time. I know UK statistics better than US ones and as far as the secular trend of labour share of income the picture is not as clear as it would seem. While the share of labour as gone down, the main beneficiaries are not corporate profit, but taxes and mixed (self-employed, etc...). There has been a significant structural shift in the composition of the labour force, where more and more people have become self-employed (mostly for regulatory reasons). So I am not convinced the statistics really say that labour income has been reduced. The split between labour and capital is not the only problem anyway. The super-star effect is as much of a problem as the actual split between labour and capital. Technology has enabled people to leverage their skills (look at entrainers in general). But only social convention (you are not allowed to freely copy content) keeps their earning power. This is not an inescapable law. A weakening of copyright law could easily unwind such effects. A significant step in wealth redistribution woulbe national health insurance. I think there's a problem with the idea that capital will have a return without labor. That is, if capital reaches the point of being atonomous, then there will be no return to the owners of capital either, as there will be no need for owners of capital. And this works on a continuum as well - the more atonomous the capital, the less need for capital owners. In other words, while I do see a trend of increasing autonomy of capital, I do not see this resulting in greater inequality. Indeed, this is a process that has been ongoing now for centuries, and it has been accompanied by a steady decrease in inequality. Imagine a world in which most products are close to free. In such a world how can inequality be an issue at all? Important detail: Stocks can be traded, but only in a separate market against other stocks. This way, you get stock prizes that can serve as a signal to direct investment. The fact that stocks cannot be sold for "normal money" guarantees that individuals cannot liquidate their portfolios in old age before they fall back to the treasury upon death. also, one could argue that it protects individuals against irrational early liquidation that would leave them without the dividend stream / basic income after squandering their wealth in a couple of years. I’ve taught personal finance to over 3,000 students at the University of Arizona and almost 500,000 through two companies I founded which are licensed providers of a personal finance course required for people in bankruptcy.What I’m interested in is the future, and what occupations will be safe (or relatively safe) in a world that looks like it will be extremely risky and dangerous with regard to personal and family financial security, even compared to today. For example, today medical doctor is the king of personal financial security, unemployment for more than a short time is virtually impossible, and the income is very high. But in the future, IBM’s Watson plus well trained nurses may displace a huge percentage of doctors. And a long term future as a pilot for a young person doesn’t look good at all. What will be safe (or a lot safer) in the future? What are good game plans for young people that can really work to not be at constant risk of financial devastation for your family? It is this kind of futurenomics that I’m very interested in. Does anyone at all research this very important area? Can you cite any books, papers, or articles? I read these opening lines: For most of modern history, inequality has been a manageable problem. The reason is that no matter how unequal things get, most people are born with something valuable: the ability to work, to learn, and to earn money. and I thought, wow, Noah really needs to read some good history books. What does he think drove the revolutions of the 19th and 20 centuries? And just how "manageable" does he think the process was. Yeah, I think it's easy for economists to assume that economic forces are powerful and nearly irresistible, and to conclude that any observed trend in the economy must be due to fundamental forces at work. So the high inequality associated with most of the industrial revolution must be a necessary and unavoidable part of early industrialization, and the low inequality associated with the postwar period is proof that a capitalist economy left to its own devices will benefit everyone, and the rise in inequality since then is due to a fundamental shift in the economy, possibly temporary, possibly permanent. The great lengths to which capitalist countries went to manage inequality in the postwar period is ignored as probably irrelevant. Noah, in the past you've noted in comments that you are against taxing returns on capital, but now are suggesting schemes to redistribute capital income; does this represent any evolution in your thinking on the subject? Redistribution isn't necessarily the only way; so long as there is some labor to be done, labor can be made increasingly scarce by requiring shorter work weeks (15 hours?) and more paid leave, and encouraging earlier retirement and more time in college, though the last two will still require redistribution from the working to retirees and college students. Less available labor will lead to higher wages while simultaneously spurring the investment that will bring about the automation age more quickly. No, my (third) proposal would indeed cause a big efficiency loss, but it is a hypothetical last-ditch measure in case of an extreme situation. If you think about it carefully, you'll see that what you're proposing has a strong component of redistribution, and causes large efficiency losses...just like capital taxation. Or just like what you proposed. You note that it will be hard to rely entirely on tax and redistribute for political reasons; this is another option. It has the nice property of still requiring people to work, while also giving us more liesure time. Personally I do not consider the dead-weight loss of an inefficient economy a more fundamental loss than the lower utility resulting from an unequal economy. And I have yet to hear a convincing argument that capital gains taxes are more distortionary than income taxes; excluding capital income incentivizes speculation as much as it does actual investment, and it fails to incentivize many important kinds of investment like going to college or starting a small business. At the very least we would have had less of a real estate bubble if capital gains had been taxed as ordinary income. But I suppose I'm wandering off topic here. Nothing brings out the class bias of economists like the issue of automation. The locus is always on low hanging fruit - get rid of the laborer. But the idea that, given the vast amounts of money paid to the executive sector for management that generally goes up when the economy is up and down when it is down, we should automate CEO level decisionmaking - and an expert system computer, properly programmed, could easily simulate the mini-Welches of the executive suite - never gets mentioned. It is as if the mystical decision makers - all of them "visionaries" - are operating in a super-rational realm. How funny. I'd like to read an account of the future of capitalism once the administration of capitalist enterprise is fully automated, and Ibm is run by a Big blue and an office of secretaries, at savings of a couple hundred million per year to the company. But I will wait for that article in vain - economists don't want the gravytrain to stop, after all. Your diagnosis of the problem as well as your proposed cure are both strikingly similar to the ideas of the late Louis Kelso. Technological change, Kelso concluded, makes tools, machines, structures and processes ever more productive while leaving human productiveness largely unchanged. The result is that primary distribution through the free market economy, whose distributive principle is "to each according to his production," delivers progressively more market-sourced income to capital owners and progressively less to workers who make their contribution through labor. He came up with various financial innovations, such as the Employee Stock Ownership Program, to allow individual workers to in effect become mini-capitalists. "Well, when you only have 1 world history to observe, how are you going to disentangle the effects of technology from the effects of policy? ;-)"
Same way porcupines make love - carefully ;-). By looking at the detail. Start with, eg, Tim Blanning's overview of the C18, and the impacts of dismantling informal networks of social protection, and the political response. Noah, Off topic, but you are #7. "For most of modern history, inequality has been a manageable problem." So why did the Jews flee from Egypt? English knights getting the first try on Scottish wedding nights? I believe the Samurai used to create equal shares with a katana. Slavery in the US was fair enough, right? Ghandi's protests were purely intellectual? Apartheid in S Africa was mostly equal? Poor humans throughout most of history have been treated as disposable items. Yep, anonymous. GAI stock options is simplest. The USA could've done this around the 1970s or 1980s, maybe not now. Instead your really rich are distracting your intelligent Democrats. Canada almost did this and Saudis give $125000 as a late teenager grant. In Canada the oil province gets rich by stealing damage deposits and only hiring local yolks. If what's lost value is the "endowment of human capital", it's not because people have lost the "ability to work, to learn", but only "to earn money". If the innate endowment of labor needs to be augmented, why not add an endowment of education? This would leverage the ability to learn, to increase the ability to make money. Make it a universal endowment, and the result should be a near-universal ability to make money. It might not be enough after robots advance into development work, but as long as robots are mostly doing physical labor, I think educating people could increase both earning potential and innovation. But I don't think the robots are responsible for the decline in labor's earning potential. I think the change is primarially that most of the business income that results from work does not go to the workers, but to owners. Another way to reduce this decline is to require that increases in business income be spend on commensurate increases in worker pay. ESOPs may help with this, but may not be enough. An extreme form might require replacing wages with employee ownership, so hiring would include issuing new shares to the new employee, and firing would include buying the shares back and dissolving them. But for this to be any different than the current system would require restrictions on the differences between number of shares held by different people, which is essentially equivalent to restricting differences in total pay without conferring ownership. What you Keynesians fail to understand is that productivity gains accrue to the workers naturally via the Phillips curve. In a free economy, if the productivity grows at 2%, then the real wage does so as well. What destroys this happy distribution is inflation caused by fiat spending in the public sector. When the public sector grows faster than productivity, the real wage is either flat or declining, and the labor share of GDP is displaced by the public share. Is this meant to be a spoof, or are you serious? This is so mixed up, I wouldn't even want to start to analyse it. 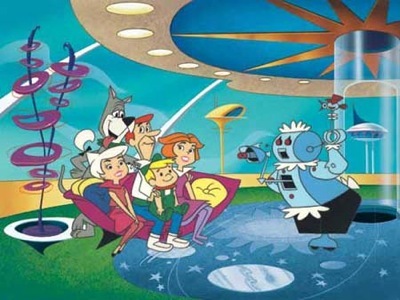 We are certainly a far cry from where The Jetsons predicted we might be. I think it is almost impossible to look to far into the future other than to focus on training, research and development to build equity rather than giving it away.